Jeremy Pelt: That’s a good question because what’s interesting about it is that from K through twelfth grade, I had a near perfect attendance record. I had only missed maybe about two or three times. In fourth grade, that’s when it was time to choose all the instruments. The one day that I had missed was that day. So, I came back to school and all that was left — I don’t know what I would’ve chosen — but all that was left was the trumpet and the clarinet. I looked at the trumpet, then looked at clarinet with all those buttons and I said, “I’m not gonna do that.” The trumpet looked the easiest, so I chose that. So that’s how that happened. Salina: When was your first gig? Jeremy Pelt: I used to play a lot on the street, you know. But anyone who’s ever been to Santa Monica, Third Street Promenade, knows that’s far from slumming it. But it was nevertheless on the street. 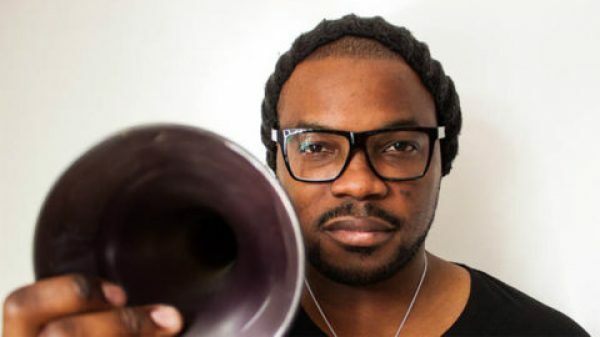 Jeremy Pelt: Keep listening and supporting! Salina: What do you think about the club? Jeremy Pelt: The club is nice. This is the first time I’ve been here. Our bassist has been here more times than anybody in the band, so I was eagerly anticipating coming up here. It’s got a great vibe and it feels very lived-in despite the fact that it’s only been 15 or so months that you’ve been here. That’s a great feeling and I wish it many more years. Salina: You had said at the mic that a lot of your friends have played here and you wanted to join them. Who were you talking about?